Smallville is a far better superhero TV series than Heroes. Smallville is a way more fun show to watch. They don't posture like they're more profound or original than they are. As far as I'm concerned, they have hotter chicks. More importantly, Smallville's characters have the advantage of being the established DC Comics heroes beloved by generations: Superman and his Superfriends. For a second, just a second, I thought they were gonna kill Chloe. And for that second I was a little relieved because then I would have been done with Smallville for good. But no, she wakes up naked in a morgue. And I'm also glad because now's not the time to leave Smallville. After hating this show for five seasons I rather enjoyed it in its sixth by embracing both its dumbness and its improvement with the addition of Green Arrow, Martian Manhunter, and the Justice League. The best part of Smallville today is that they seem fully committed to turning the show into Action Comics. Smallville is much more now than the hoary "teen Superman growing up" concept they've beaten to death. 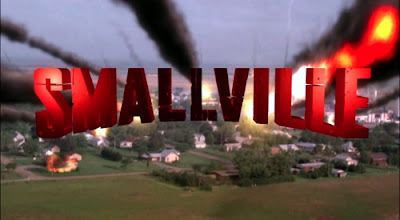 Little by little over the years, and full-on in season 6, Smallville has become the DC Universe on television. This show is now four very hot chicks surrounded by superheroes and supervillains. The Kents are gone, everyone is 21 or older, the pretenses that they are kids in school and must go to classes, etc. look ripe for permanent abandonment. If Clark somehow finally does the 180, stops being a selfish dumbass and begins acting like SUPERMAN, that will be the final piece of the puzzle missing. As Smallville turns into Action Comics: The Television Series, it's finally really finding itself. As series reinventions go, this is pretty fun. Still dumb, sure, but mostly fun. Clark really needs to get on with learning how to fly. It's time he wore the tights and cape. It's time he really, finally becomes Superman. And stops being such a douche.